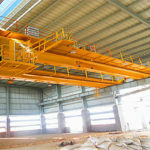 100 ton overhead crane belongs to the heavy duty bridge crane. With the development of modern industrial production, the amount of material handling also increases. In order to improve the labor productivity, it is necessary to greatly increase the number of lifting appliances. It has the widely usage range and is one of the largest number of lifting appliances. According to the working characteristics of cranes, we consider design of parts, metal structures and determining the power of cranes. Weihua adopts the advanced technology to improve our product’s working ability. It can load and unload various materials. If you want to lift special goods, you can contact us as soon as possible. We can provide you with special hook or electric hoist to deal with these problems. We adopt special material to integrate the crane, so the product can work in severe environment. Generally, the crane can work at the temperature of -20 to +40 degrees. If you want to customize our products, please get in touch with us quickly. We has the first class service. If you have spare time, welcome to visit our factory in China. 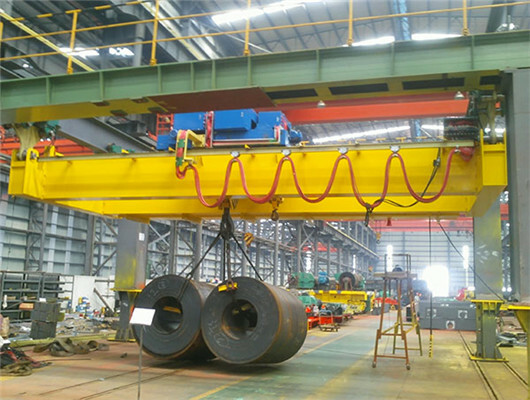 You will find out more surprises about the 100 ton overhead crane or other lifting equipment. The foundry crane is the main lifting equipment of steel casting and continuous foundry-making process. The structure of the product is divided into different types including double beam double-track, four girders and four-track, four-girder rail and other models. 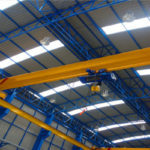 Generally, the first and the second models are used in medium-scale and large-scale overhead crane. The third model is widely used in the casting overhead crane of large tonnage. 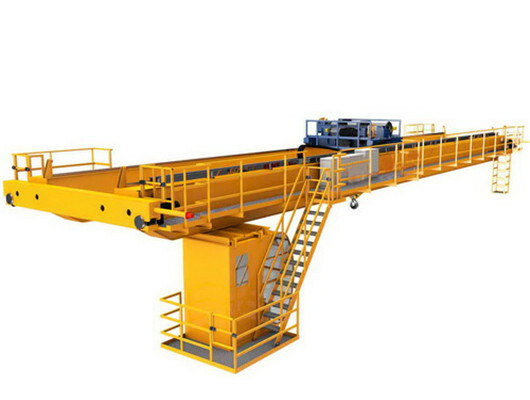 The 100 ton YZ foundry overhead crane is composed of crane travelling mechanism and lifting mechanism. The lifting mechanism is comprised of the crab travelling and trolley travelling mechanisms. The the lifting height is made up of the main and auxiliary hooks. The speed of lifting is mainly controlled by four parts of main and auxiliary hooks, crab travelling and trolley travelling mechanisms. The crane rail recommended adopts the QU120. The power supply uses the 3-Phase A.C.50HZ 380V. It is widely used in these conditions of lifting and transportation of liquid steel ladle. 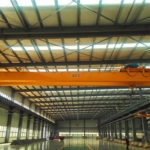 Our company’s 100 ton overhead crane has many advantages of beautiful exterior, economical and durable structure, and safety and reliability. We adopt the advanced technology to increase the product’s working effectiveness. In addition, our foundry crane can offer various foundations with rotary spreader. It can change the gantry hook from the variable, and display load weighting. 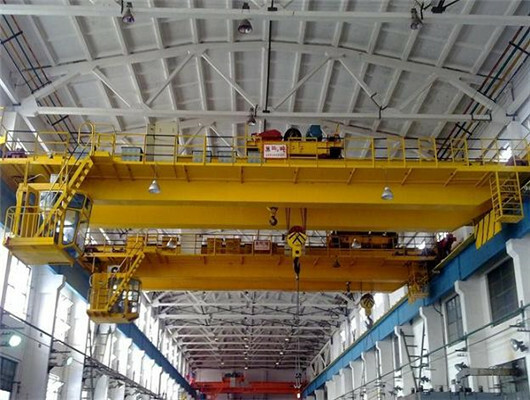 The 100 ton overhead crane is composed of the bridge, crab travelling and trolley travelling mechanisms, electrical equipment, etc. 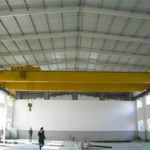 QDY model foundry overhead crane is used in severe environment of the heat and high dust. In addition, it can be widely used in the working place of the lifting molten metal. The working principle includes many operation process. It adds material bay to charge hot metal to the converter and lifts hot metal in refine bay to refine furnace in converter. Or, it lifts molten steel to ladle turret in molten steel bay. For electrical control devices, we have developed into a fully electronic digital control system. It is mainly controlled by the full digital control of the drive device, programmable logic controller PLC, fault diagnosis and data management systems, digital control given given detection and other equipment. 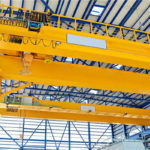 It gives the crane an information function that enables information transfer, processing, and power control, which greatly improves the overall level of automation. Owing to the heavy tonnage, we install some safety devices and take some measures. All of working process can be finished in the driver’s controlling room. You can choose the remote controller to work together in order to ensure safety and reliability. 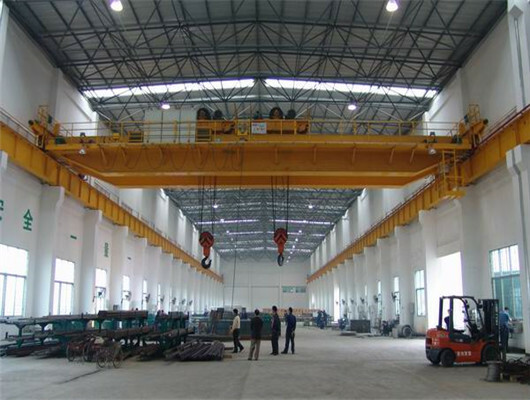 In addition, if you want to simply operate the 100 ton overhead crane, you can choose ground and remote operation. All in all, if you want to safely operate the lifting equipment, we advice you to choose the operation in the cabin. There are two reasons. Firstly, because the crane is used in the harsh environment, you should pay attention to the safety and reliability of users and products. Finally, in the cabin, the operator can see the surrounding environment of the suspended object and have a better view, which will prevent some accidents. The driver’s room is divided into the common cabin and space capsule cabin according to the different appearance. As the crane operation, keeping the crane stability is one of the basic skills for practical operation. It is an essential part of the work operation to complete every lifting cycle. 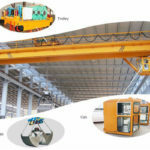 The crab and trolley travelling mechanism and lifting mechanism of overhead cranes have high and performance, safety and reliability when operator uses the overhead crane. 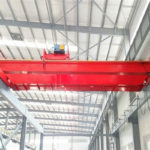 However, the hooks are far from the center of gravity of the cranes when lifting, improper operation, or the position of the ground staff are skewed, or the wire rope is too long, which will lead to some accidents. If it is not equal, it will produce swing and instability. Theoretically speaking, if the gravity of the hanging object itself and the pulling force of the wire rope on the lifting object are equal and opposite in direction when the crab and the trolley travelling mechanisms of 100 ton overhead crane are operated without swinging, the entire machine can safely operate. However, in actual operation, the inertia caused by the movement of the object can’t maintain its balance in a stationary state immediately, when it loads or unloads the materials. Especially when operation of the crab and trolley travelling mechanism is too fast, this swing is even more obvious. In addition, sudden or rapid braking also causes sway. 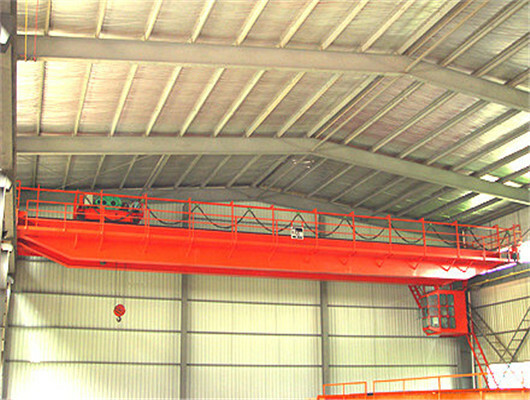 So, we should pay attention to the crane training and give some reasonable courses for customers. After over 30-year development, we can fully deal with a series of problems. Our products have strong performance with safety and reliability. 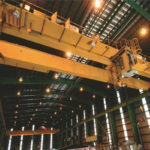 Compared with traditional general-purpose bridge cranes, the 100 ton overhead cranes of our company have the advantages of light weight, low noise, low headroom, and low energy consumption, which not only reduces the crane costs with manufacturing, transportation, and installation, but also reduces the cost of its plant and crane procurement, as well as usage and maintenance costs. This kind of crane has a relatively early international production. Due to the development of domestic technology, there are parts of lifting equipment including the wire ropes, hooks, and steel properties. Their structures have their own characteristics. In recent years, with the continuous improvement of the performance of domestic steel products, especially for the improvement of the performance of hardened gear reducer, high-quality steel wire rope, high-strength hooks, etc., our product is close to foreign famous brands, and the materials are all made in China. On the other hand, we have made the breakthroughs in new types of processing equipment and processing technology. 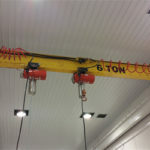 All of these have created conditions for the development of heavy duty overhead crane. If you are interested in our products, please send email or directly call us.